After 15 very happy months living in Townsville, North Queensland I’m returning to London for three months. 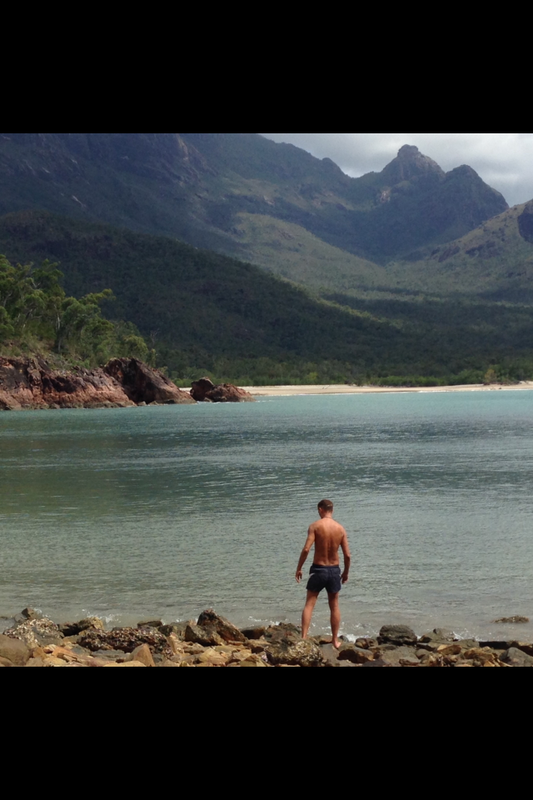 Being surrounded by great natural beauty has had a transformational affect on my mind and body. At 46 I feel the healthiest and happiest that I have ever felt and I feel that much of that is down to the simple, slow paced life in the tropics and the sheer beauty of the place. Being in awe of nature seems to stop me dwelling on the small stuff. Just before I returned to Australia, in March 2014, my mum died very unexpectedly. One minute she was baking cakes, playing tennis and looking forward to the arrival of more grand children. The next day she was just gone and I was reading a poem at her funeral. 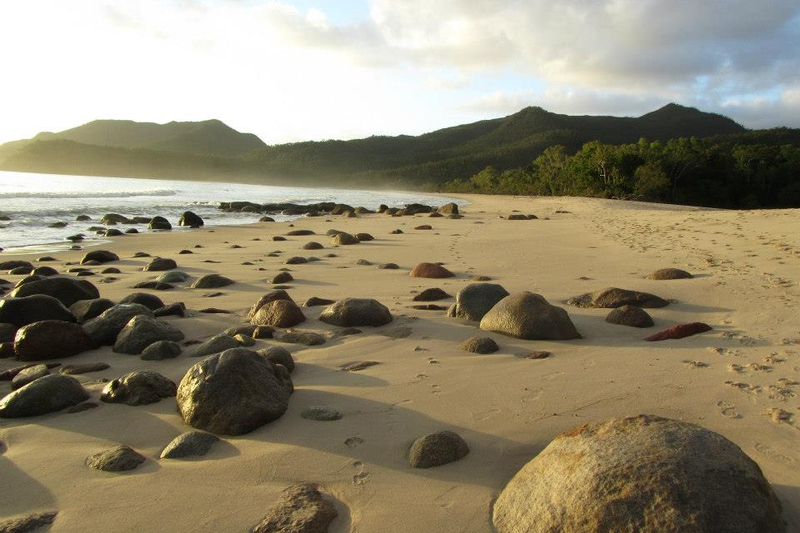 Hinchinbrook is uninhabited and a maximum of 43 people are allowed to visit and camp on the island at any one time. You have to bring your own food and camping equipment and are required to take all your rubbish away with you when you leave. The suggested track to walk along is on the eastern side of the island facing out to the blue Pacific. The Western side faces the mainland of Australia, is full of mangrove swamps, and swarming with crocodiles. You are therefore cut off from the mainland by the steep mountain peaks behind you. At night the only lights are the stars and the only sounds, the animals. Each day consisted of a seven hour hike through dense tropical rainforest and over beaches carrying heavy backpacks. We woke before the sun came up at 5am and slept at 6.30pm as the sun set. But I was also interested in the transformation of my mind. By about day three of our adventure I realised that if I walked in front, along the track, there was nothing in my field of vision which was man made. All I could see was rainforest, beach, sky or sea. There was nothing on the island made by man. Throughout our journey all we had to consider was where to get water from and to be alert to dangers such as snakes and crocodiles – we met several snakes on the path and saw crocodile tracks near our tent! I’m interested in what happens to your mind when all you see is nature. I think we reflect what we see and fall into harmony with it. Man-made things are usually other people’s attempts to satisfy our existing needs and desires, or to entice us to manufacture new needs and desires. Occasionally man-made things are simply produced to be beautiful. Man-made things force us to make decisions. They play to our senses, they make us compare what we have to what others have, and what we could have. Even things made by man for beauty force a decision from us about whether we think it is a beautiful thing or ugly. Nature is different. The plants and animals around us have come into existence through evolutionary efficiency. They evolved to become the form they are because nature has no choice. Things flow into a new form in order to thrive. Nature is not on display for our satisfaction. It is arranged to be the best it can be. The plants and animals fight and co-operate with each other in perfect harmony to create perfection. Man’s creations are based on opinions and thoughts. Man-made objects attempt to freeze time and create a false idea of the permanence of beauty, or usefulness. When we surround ourselves with nature we reflect its non-thinking state and become engrained in the moment. We become part of the cycle of birth, death and rebirth. As you walk along the path and observe rainforest you start to feel that the boundary between you and the forest is illusory. You detach from your thoughts and realise you are part of a whole and not separate. As we become more connected and use technology to do great things with our lives we also need to spend time immersed in nature. If we fail to do this we move away from our true essence. The more time we spend away from nature, the more we turn inwards and inflate our egos. Our thoughts are fanned and we become isolated people. Nature reflects our true essence of belonging to the earth and the elements. In the photograph below you can see the rubbish that two of us created in four days – about the size of two or three Pret a Manger sandwich wrappings. Optimising our wellbeing and having great experiences does not equate to ever-increasing levels of production, consumption and material acquisition. Our weak politicians fail to understand this. Growth is still the mantra. While we were on the island a report came out that half the Great Barrier Reef’s coral has been destroyed in 27 years. Experts argue over the causes of the destruction, however, most of the blame for the massive reduction in biodiversity that follows the death of coral reefs can be placed squarely on the growth of the use of man-made chemicals in farming and mining along the Queensland coast leaching into the Pacific. I hope you found this useful and thought provoking.